I had lunch today at Beijing Restaurant in SF with Eva. I found good reviews on Yelp and saw that Yao Ming had been there so I wanted to give it a try. - Hot and Sour Soup: It was sour but not very spicy. - Stirred Flour Balls with Chicken: Shapes were more like cubes rather than balls. Texture was similar to rice cake. 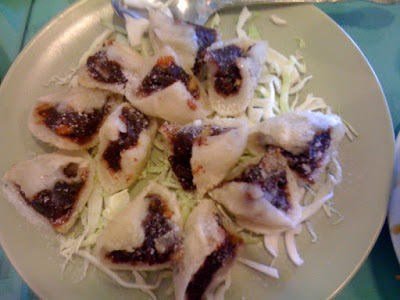 - Fried Sweet Cake Beijing Style: Mochi texture with red bean filling. In the afternoon we picked up Eva's younger sister from school and had drinks at Java Beach Cafe. Eva also gave me more Taiwanese tea and snacks.